Our workers here at Four Seasons Landscape Management can handle any type of concrete works with utmost efficiency and attention to details. Incidentally, we are among the very few landscape services providers operating in the Newnan area and the State of Georgia with memberships to various industry organizations. For one, we are a proud member of the prestigious National Concrete Masonry Association (NCMA), which means that we are highly qualified to take on any of your concrete work needs. And before you think that we charge a fortune for our services because of such credential, we are actually offering very affordable rates for our concrete-related services. So if you are on a budget and only need to have simple structures in your property, then avail of our concrete work services. Concrete driveways. Most driveways are made of concrete because it is easy to prepare and the materials are widely available. 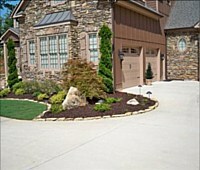 Concrete driveways can actually be made to mimic natural stones using special techniques and components like dye or mold. Our concrete works such as these are also meant to add market value to your property. Walkways. Walkways are important parts of any landscape area. They encourage leisurely walks and strolls all around the landscape, which can be both exhilarating and good for the heart. Garden steps. 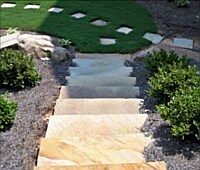 Garden steps lets you go up and down specific areas in your landscape garden. With our expert masons, your garden steps will look stunning and not just plain looking. Walls. Concrete walls are important to serve as protection against intruders. They can also serve aesthetic purposes when handled by skilled workers like ours. Fences. Fences also serve safety and decorative uses. Concrete fences can be painted to make them attractive. Why Choose Us for Your Concrete Work Needs? While there are many homeowners and landscape service providers who shun the use of plain concrete because of durability issues, we see to it that our work meets or even exceed industry standards so that it will last for years. Our expert masons also ensure that they prepare the area properly to facilitate smooth workflow. We also use only the right aggregates in every concrete work that we do so that durability will never have to be a cause for concern. As it is, with the right techniques such as the ones used in decorative concrete, you can have a concrete structure that is durable and beautiful. Call us today for inquiries on our concrete works services.